Keep in mind, there are at least 28 different types of ducks living in North America, other water fowl notwithstanding. 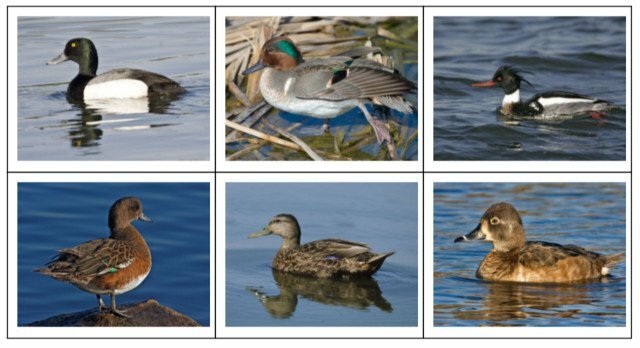 See how well you score on our duck identification quiz below. We divided the ducks into two groups: diving ducks and dabbling ducks. You’ll recognize dabbling ducks by watching them feed. They do not totally submerge when feeding. They just tip down to reach aquatic plants and invertebrates below the surface. Also, dabbling ducks are more buoyant than diving ducks. You can recognize diving ducks by looking at their legs that are placed further back on their body unlike dabbling ducks. That makes them clumsy looking when walking on the ground, but it also makes them effective when swimming under water as they feed. To get airborne, you’ll see them taking a “running” start on the water. Often called pochards or scaups, you can find them in the northern hemisphere.